​Numurkah Secondary College is the co-ordinating school for the School Bus service. In the past families could only be notified via phone of any emergency situations (assuming contact details were up to date). 'Team App' will be used starting Term 3. 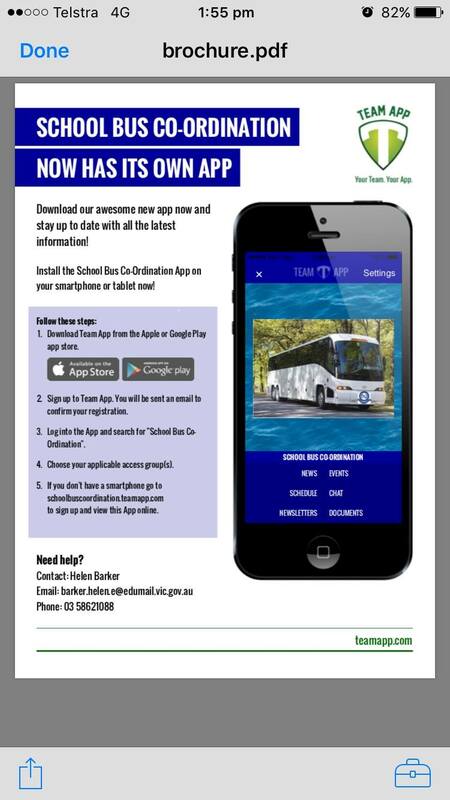 Parents who download the app will receive notifications relating to the bus their child travels on. 'Team App' is free to use and is available for IOS, Android as well as desktop. In the 'Documents' section, there is a map of all the bus runs and also a bus application form. The 'Events' section will contain student free days etc. Any further queries please contact Helen Barker at the College on 58621088, or email barker.helen.e@edumail.vic.gov.au.